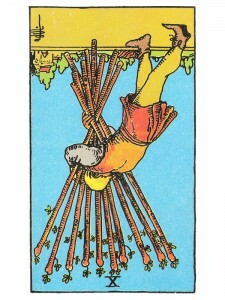 Ten of Wands (R) says take a look at your original goal and see if you are still on course. When you fulfill personal obligations and agreements, you develop the maturity essential to all social relationships. You develop faith in yourself and your ability to accomplish your goals. Your burdens have increased in weight and number to the point where you may collapse from them – physically and emotionally. You are holding yourself back, limiting your vision by giving your power to others. It is vitally important that you release yourself – stop restricting your activities and remove yourself from the oppressive situations in your life where you feel you are holding yourself back and unable to fully express all of who you are. Throw down the burdens, attempt a new direction and use your energy for a better, more constructive purpose. Continue to grow – don’t give up now – be willing to take the risk and reach for your goals. There may be an overly long pause at this level, a hesitation to go on with the next task. Spiritual egotism – presumption of a high order. Spiritual abuse, negligence. Spiritual vertigo. The symbol of Fascist Italy was a bundle of rods tightly tied together – suggesting that the Italian State had combined and coordinated the force of all its elements. Here is power without the commensurate level of responsibility. Followed by Nine of Swords: Success can be stopped – prepare your mind for any opposition that could arise. In the first position: Your lessons are in how to be a good guardian angel. You must learn how to polish the apple, not how to be an apple polisher. In the second position: There may be the temptation to perform magic, thereby distorting the spiritually equitable distribution of material resources. In the third position: What you have presumed was your work is the work of another. In the fourth position: this love of Godly spirit, however noble, must not be in lieu of worldly love or it is not Godly spirit. Even the recluse, the monk, the ascetic to be on the proper path – must love the world and all its material wonders and be intimately and intricately involved with its progress. In the fifth position: The present work situation does not add up for you. Your evaluation may be correct; this may not be the correct work. Or, this may be the correct work and it is your evaluation, your attitude that is in error. In the sixth position: The demands of higher responsibility may be hard for you to accept this next year, but the choice is yours. You may not get much help from others. In the seventh position: This interim may be a little frustrating as you will feel you are ready for more responsibility, but you must handle what is in front of you before asking for more. In the eighth position: There may be considerable abuse of power taking place here. In the ninth position: Your heart is having difficulty offering up the energy, the motivation you need if you are to meet this task. At another extreme, your heart may be offering too much energy for the situation or energy for the wrong situation. In the tenth position: It is easy to get confused even at this level, for with greater knowledge comes greater temptation, greater power. Be cautious of the trap of accepting only one – half of the inner/outer duality/reality of God. Neither assume the identity of God via the godness in you, nor disappear in the God outside of you losing the identity which is the purpose of your incarnation.